The No. 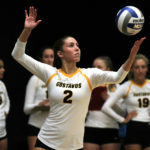 10 Gustavus volleyball team Thursday night claimed its fifth consecutive straight-set victory, defeating St. Olaf 25-23, 25-20, 25-21 to improve to 15-2 overall and remain undefeated in the MIAC at 6-0. 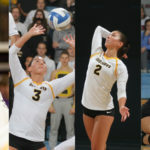 The Gusties played from behind in all three sets, but were able to string together rallies for the shutout victory. The No. 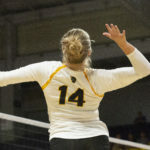 12 Gustavus volleyball team made quick work of Carleton on Wednesday night, winning in straight sets 25-14, 25-22, and 25-10. The victory moves the Gusties to 11-2 overall and 2-0 in the MIAC, while the Knights fall to 10-2 overall and 1-1 in the league. The No. 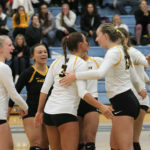 9-ranked Gustavus volleyball team started the Loras Invitational with a pair of wins Friday. 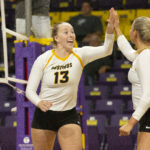 The Gusties dropped only the second frame against Dominican and rallied to win in four sets, followed by a shutout victory over Dubuque, improving to 5-1 overall. 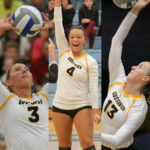 With 20 kills on the day, Lauren Hanson (Sr., Redwood Falls, Minn.) became the 14th member of Gustavus’s 1,000-kill club. 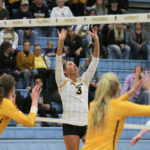 The Gustavus volleyball team wrapped up play at the Trinity National Invitational on Saturday with a pair of wins to improve to 3-1. 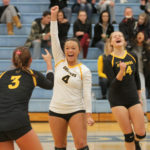 The Gusties beat Aurora 3-1 and then swept Cabrini in straight sets.